John Oakley was born in Georgian England to Edward Oakley and Hannah Headen (or Haden) in Woodside a residential area of Dudley, Worcestershire, England in 1823. 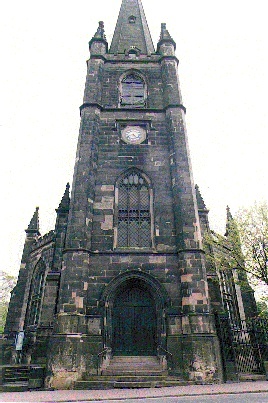 According to the English select births and christening records he was baptised at St Thomas in Dudley on the 21st September 1823. The Oakley family were Protestant. John’s siblings were Sarah (12 May 1816), Mary (28 December 1817) and Elizabeth (30 May 1819) Ann ( ? 1830) all born like their brother in Dudley. There were rather a lot of Oakley’s in Dudley so I wonder as to their relationship to each other? Dudley was a central area of coal mining and commerce in the West Midlands of England. When John’s family were there it was known as Worcestershire. (I’ve been reliably informed by a native Brit that this is pronounce “woost e sheer”. Boundaries however changed as borders changed and it can frequently be found as Staffordshire also. The midlands area had the thickest seam of coal and iron-ore in the country. It also had one of the largest slums in England and a cohort of desperately poor. John’s mother Hannah died when he was only a young boy of around 8. John’s father, Edward Oakley was a Coal Miner in Dudley and like his father before him John also went into the mines at a young age. He is recorded aged 17 as being a Collier. A Collier was anyone who worked underground in the mining industry. It also referred to a miner who worked at the coal face hewing out the coal. Dudley and its surrounding areas which came to colloquially be known as the ‘black country’ because of it’s constant pall of soot, coal dust, smoke, waste and other environmental pollution was generally considered to be a fairly miserable sort of place whose existence circled around the mining industry and a variety of supporting trades. In 1852 a report to the General Board of Health on a preliminary inquiry into the supply, drainage and sanitary conditions of water in the area earned Dudley the ignominious remark of ‘the unhealthiest place in the country’. Due to its rich natural resources and mineral deposits, Dudley industry in the nineteenth century included iron, steel, engineering, metallurgy, glass cutting, textiles and leather working. Young boys through to older men worked in the mines – mind you their eyesight, hearing, lungs and general well-being and chances of a normal lifespan were greatly reduced through illness, disease and the very high risk of accident and injury. To be a coal miner in Dudley was the equivalent of being an agricultural labourer in other parts of the country. Hard work, poor pay and undesirable working conditions. At the very least the agricultural workers got fresh air! The living conditions in Dudley for many was a continual existence of subsistence and a likelihood at some stage of being significantly impoverished and possibly being admitted to the Dudley workhouse. Young John it would appear apart from being a collier – was a prolific thief. He was recorded as having repeatedly stolen from his workmates, swiping their tools and even a conviction in 1840 when he was sentenced at thirteen years of age to 14 days and being whipped did not slow him down. He worked at different mines in the area like many of the miners and eventually was caught having lifted a rather expensive length of rope. John had what seems an inordinately long period upon the hulks before being transported and whether his behaviour accounted for this delay in his being sent out? He was recorded as being a ‘very bad and violent character’. Three years after being convicted he set sail for Van Diemens Land. John’s prisoner description record prior to his journey upon the Mount Stuart Elphinstone is probably one of the most detailed I have found. John Oakley, Scar R side of mouth, Tattoo anchor, bird, heart, glass, on left arm below elbow. Surgeon report – good. Convicted (twice) stealing rope third offence. Protestant can read and write. Tried 3 Jan 1842. Embarked 30 Jan 1845. Sailed 26 Feb 1845. Arrived 17 June 1845. Aged 21 (transported). 5ft 1 1/2 inch. Fresh complexion, round head, dark brown hair. Oval shaped face. Brown eyebrows, brown eyes. Tattoos in the nineteenth century were common among soldiers, workers, miners, sailing folk, criminals and prostitutes. The perception of the day often being that those from low social classes were frequently tattooed and that this was also an outwardly rebellious sign of a deviant person. One popular urban theory being that the more tattoos the more persistent the criminal. Traditionally the anchor was a symbol for those whose careers lay on the sea. However what is also not commonly understood is that the anchor originally served as a symbol of hope. Maybe it was this sense of hope that made this choice of tattoo meaningful to John. Bird tattoos often meant the end or completion of a journey. It also of often represented being a free spirit. Heart tattoos represented the love of one’s kin and family. If the heart was crossed with an arrow then it meant that one had a love. John’s remained uncrossed so likely was homage to his family. Glass. This one I found curious but upon researching this in more depth the glass that was referred to was almost definitely an hourglass. The hourglass or glass as they were called frequently represented having time on ones side or time. (see reference page for sources). I wonder did John get these tattoos in prison prior to leaving for Van Diemens land? He certainly did have a lot of time to consider. Did this symbolise his fourteen years? Did the heart represent and remind him of his loved ones in England and a desire to return to them one day or a knowing that he never would? The placement of John’s tattoos on the lower arm is not likely to have any meaning other than this was the commonplace to have tattoos at this time period. Tattoos on the hand were also not uncommon. Left or right that is the next question. Well John’s tattoos were on his left arm. I haven’t been able to locate a conclusive school of thought on this one despite much online research but it is likely that we can conclude John may well have been left handed as the dominant arm was the one often tattooed. (having tattoos one wants to see them). Either way John Oakley was one of the two hundred and sixty convicts transported aboard the Mount Stuart Elphinstone bidding farewell to England on the 26th February 1845. After 106 days at sea the Mount Stuart Elphinstone arrived to port in Van Diemens land. John’s convict record advised his character by the ship surgeon (Gordon) as ‘good’. He could read and write and was recorded as his occupation having been for three years that of a Tailor. Not sure where they got that one from. A few years later another John Oakley from Gloucestershire came out to Van Diemens Land as well, he is not ours. However it is easy to confuse the two. They were both tried at Worcester but this John came out on the Lady Montague. Mary Anne White in 1851 was an inmate of the Kilrush Workhouse in County Clare, Ireland. In this same year and prior to her leaving the workhouse there was the death of another White. This was Norry White a three year little girl old who died on the 24th March 1851 of diarrhoea. Was she a relation of Mary Ann? In 1850 and 1851, one thousand six hundred and thirty nine souls died in the Kilrush workhouse. Our Mary Ann could have just as easily have been among them. Dysentery, fever, whooping cough, consumption (tuberculosis), pneumonia, small pox, measles and debility through starvation and poor living conditions all of these contributed to the high deaths in the workhouse. Comments from those admitting the derelict into the Kilrush Workhouse, recorded comments such as “a mere skeleton”, “did not come in until quite broken down”, “a mere starveling”, “admitted in a wretched state, “was found speechless on the road (caused by want and cold). The Great Famine, or potato famine at is was called originated in 1845 and its immediate effects lasted through to the 1850’s. The death-count numbered around 2 million. There are as many stories or more of the people who lost all, the people who survived and the fact that Ireland before the famine and Ireland after the famine could never be the same again. Following the arrival of the blight in 1845, the Irish people looked to the British government to send relief and when this did not come they looked to the government as the perpetrators of the famine. Not because of the disease of the potato itself, this was an airborne fungal spore. But because the government tacitly allowed what has been accused as an ethnic cleansing through inaction of Ireland’s most poor and vulnerable. What was colloquially known as the ‘troubles of the Irish’ or the ‘troublesome Irish’ could be seen by some as the matter taking care of itself. The governments of Sir Robert Peel and Lord Johns Russell the prime ministers of the British governments of the day have been roundly criticised ever since for the slow and insufficient support that was offered. To give some texture to these statements, the following was reported in the Colonial Times (Hobart) on the 18th July 1851. Just a few months before Mary Ann arrived in Tasmania as to the political feeling of the time in England. The diaspora or great exodus of Ireland was well and truly underway. The reason the potato was so important to the Irish was that it was an easy food to grow that could be grown successfully even in poor or rocky ground. It was readily available, cheap and could stretch in the stew pot. The majority of people in Ireland did not have access to meat on a regular basis or a wide and varied diet. For the common-folk potato was a stable and staple food source. The main meal of the day for most folk prior to the famine and following often was a common dish known as Colcannon or Champ by the Irish. Just about everyone from a British background would recognise ‘Savoury Cabbage’, we all grew up with it in its various forms. The recipe hasn’t changed overmuch. When the potatoes were no longer available and the subsequent failure of the 1846 and 1847 crops the other choices of food for the common folk was too expensive and not readily available. Hence starvation set in. I have looked at indexes from the Kilrush Union between 1847 and 1849. There appear to be a few White’s so I’m not sure which if any of these were Mary Ann’s family but the White’s that were evicted were for non payment of rent and in most cases their homes were ‘thrown down’ (destroyed so that they could not be re-inhabited). The families including children were turned out onto the roadways. Mary Ann appears on the passenger list for the Beulah. 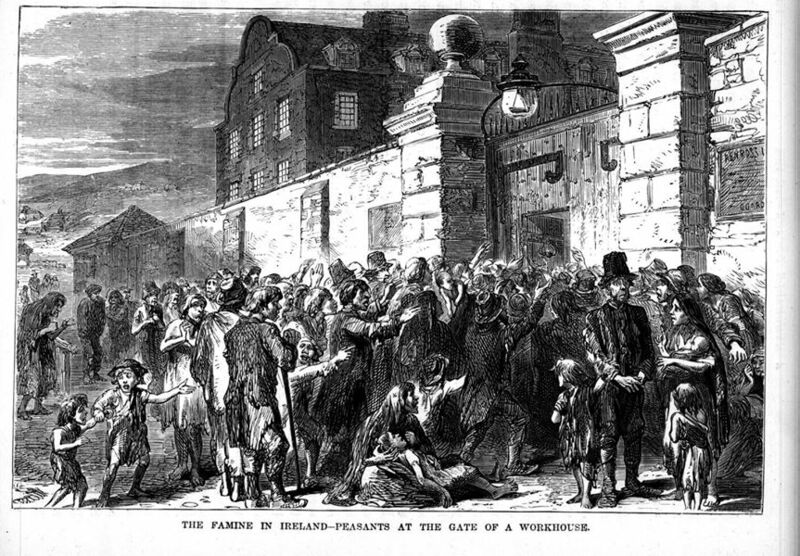 The Colonial Land and Emigration Commissioners arranged (in Britain) for one hundred and fifty girls from workhouses of Ballyvaughan, Ennis, Ennistymon & Kilrush to be sent to Van Diemens Land following the Irish Potato Famine and it’s devastating effect on the people of Ireland. The girls in the workhouses would have been at the most destitute level. Likely orphaned or abandoned by starving families their lives in the workhouse would have been dubious and high risk at best. The girls traveled onboard the sailing ship to Van Diemens Land under the Orphan Emigration Scheme. On arrival at Plymouth from Dublin, the girls were joined by ten more from the Portsea Island Workhouse in Hampshire. On 15 July 1851 all one hundred and sixty two workhouse girls together with seven married couples and eight children embarked on their journey, which would last for a day short of sixteen weeks and finish at the Old Wharf at Hobart in Van Diemens Land. Mary Ann was from the Kilrush Workhouse in County Clare. A Catholic girl of eighteen who did not travel with any other family. Upon her arrival The Courier Newspaper reports on the 30th August 1851; (uncertain as to actual age). THIS fine vessel, with female immigrants, arrived in our harbour on the evening of Thursday, after a good passage from Plymouth, having on board 204 persons, one of whom has come out to join her husband in this colony. The Surgeon-Superintendent, John Arthur, Esq , and Capt. Linton, the commander of the Beulah, speak highly as to the conduct and character of the immigrants, who are all of a very healthy appearance and in good spirits. Of the single females, whose ages vary from 18 to 23, 44 are from Kilrush, 50 from Ennistymon, 55 from Ennis, 2 from Ballyvaghn, in Ireland, and 10 from Portsea, in England. The others, about 40, consist of the schoolmaster and wife, a matron, four submatrons, and married immigrants with their families. The general arrangements of the ship appear to have been carried out with great credit to all parties. 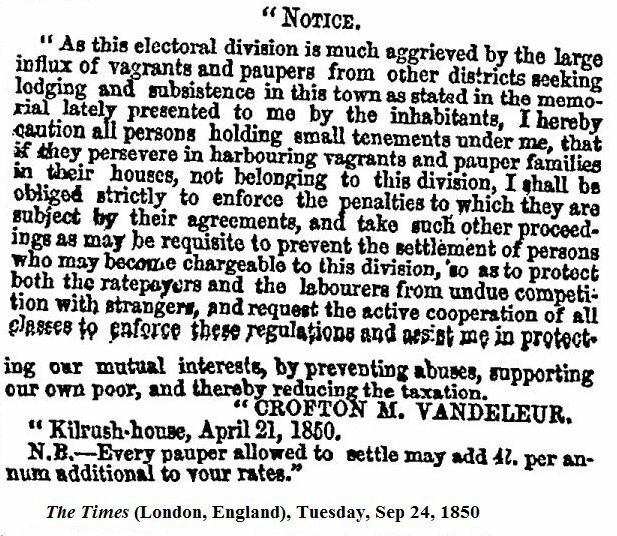 These immigrants have been sent out by the Colonial Land and Emigration Commissioners, and the expenses are to be paid out of the sum of the £10,000, which has been specially voted by the House of Commons for Emigration to Van Diemens Land. ‘The Committee of the Tasmanian Female Immigration Association hope to be enabled to land them early next week, as the building on the Old Wharf will be ready for their reception. We are further enabled to state that the Committee do not purpose hiring any from the ship, but immediately upon their landing, and the arrangements are completed, due notice of hiring will be given. ln the meantime applications may be forwarded to the Honorary Secretary, at Capt. King’s Office, where many have been already received. We may mention that the Lieutenant-Governor has received a despatch from Earl Grey, under date 15th April last, suggesting the formation of a Committee, as the colonists have already done. The local government has been advised that it was intended to charter another vessel for the conveyance of 170 more females to this colony. Mary is recorded on the passenger manifest as being 18 and from the Kilrush workhouse in County Clare. After disembarkation the girls were accommodated in a converted warehouse originally built for the Leith Australian Company on the Old Wharf at Hobart. For the girls who came aboard the Beulah, finding work in Van Diemens land was relatively easy and quick to occur. Mary Ann is recorded as an assisted immigrant. She was employed by Mr or Mrs (it is hard to read the transcript) Evans of New Town (Hobart) for a period of twelve months for what looks like ten shillings (on her discharge papers from the Beulah.) She was close friends with another girl from the Beulah, Honora Ryan (20) who pops up again later as a witness at Mary Ann’s marriage to John. Honora is more commonly known as Nora. Mary Ann was probably in the eyes of the authorities not the most biddable of souls and she managed to get herself into strife with her employers. Mr George F. (Francis) Evans who posted a warning in the Colonia Times on the 15th March 1853 warning other persons not to harbour or employ her as she was an abscondee. Whilst she was no convict, he no doubt felt she was ripping him off by not staying the full year to work for him. I’m a firm believer in two sides to every story and I would love to be able to ask Mary Ann why she left his property? Somehow I doubt it was as cut and dried as Mr Evans warning in the papers. These were tough times however and in March Mary Ann found herself in front of the Hobart Lower Court where she was charged with having been ‘absent without leave’. She was convicted and sent to the Hobart House of Corrections with hard labour for one calendar month and to pay costs. On the 29th April 1853 Mary Ann was back in court (I’m liking this woman more and more), now aged 19 misconduct and being insolent to her employer). And guess what? Yes back to the house of corrections for a further fourteen days. At this point I would like to acknowledge and thank Peter Oakley of Tasmania for providing important information including dates and references and his valuable reflection regarding the above for Mary Ann with her connections to the Evans family. (2016). Between 1821 and 1853 Tasmania or as it was known Van Diemen’s Land, had five establishments for women who passed through their portals either as convicts, those convicted of crimes and those pregnant (who apparently shouldn’t have been) and their children. These were also known as female factories or houses of correction or simply as factories. They also served a purpose similar to the workhouses of Britain as a place for ill or infirmed women with no other reasonable means of support. They were largely considered to be places of punishment. Refer and acknowledgement to: Dr. Trudy Crowley. https://sites.google.com/site/convictfemalefactories/life-in-the-factories/life-in-van-diemen-s-land-factories. To date I have now been able to trace two of my ancestors who went through these places. One in the Cascades Female Factory and now Mary Ann White at Hobart. Around 1853, 1854 Mary Ann bumps into John Oakley and (with thanks again to Peter Oakley for his research and sharing this information), it is thought they might have both been working at Bushy Park (famous for its hop production nowadays but in its infancy of production at that time). Probably for either the Haines or Ballantynes properties. Peter has been able to trace John Oakley working for John Haines and then later at Ballantynes. Also at this time John Oakley was working with Honora Ryan’s husband at Haines. Honora of course being Mary Ann’s friend from their Beulah days. By this stage Mary Ann had parted ways with the Evans family and turns up in Bushy Park. I like to think that they were both feisty souls who had bristled against authority and who found a kindred understanding in each other. Before long John had applied for permission to marry from the government of the day (which he was required to do due to his convict status). This was approved on the 6th May 1854. John was given a ticket of leave/pardon at ten years of his service. John was recorded in the Cornwall Chronicle (Launceston) on the 21st January 1854 having been granted his ticket of leave. On the 5th June 1854 Mary Ann and John Oakley married by banns in the Catholic Church in New Norfolk. Both gave their mark as an ‘X’ on the records. This usually indicated that one could neither read nor write; which would most certainly have been the case for Mary Ann. John adds a reference of Mt Stuart Elphinstone (a convict ship) and that he is a Protestant and also a Servant. Mary Ann is listed as a ‘free’ woman. Mary Ann and John moved out to ‘Black Hills’ Macquarie Plains, New Norfolk to start their lives together and raise a family. They didn’t waste any time and the following April 1855 their first child Hannah (Annie) Oakley being born at Macquarie Plains. A son, Edward Arthur Oakley born in New Norfolk in 1856. John Morrice Oakley Macquarie Plains in 1857. Sarah Ann Oakley, New Norfolk 1859, James Oakley in Hamilton 1861. A daughter Elizabeth Margaret Oakley born on the 25th April 1863 but dies a year later on the 2nd May 1864. Mary Jane Oakley born in September of the same year, 1864 at Hamilton. Thomas Francis Oakley born October 1866 in New Norfolk. Their final child Alfred George Oakley born in Macquarie Plains in 1869. Nine children with eight surviving childhood. John and Mary Ann took up farming and whom should the younger people meet up with but the nearby Kingshott’s and Hay families all of whom inter-marry into the Oakley family. John died at the very ripe old age of 82; The Mercury Newspaper, OAKLEY -On December 30 1904 at his late residence, Blackhills John Oakley after a short illness, in his 82nd year. Funeral will arrive at New Norfolk Cemetery at 1.30 p m on Sunday, January 1, 1905 Friends respectfully invited. John Oakley is buried on his own and his marker is about 3 metres in a direct line from the base of this above headstone. I’m a descendant of John and Mary Ann Oakley through their second youngest son, Frank (Francis Thomas). I’ve been researching the family on and off over the last 30 odd years and have accumulated quite a lot of detail regarding them. 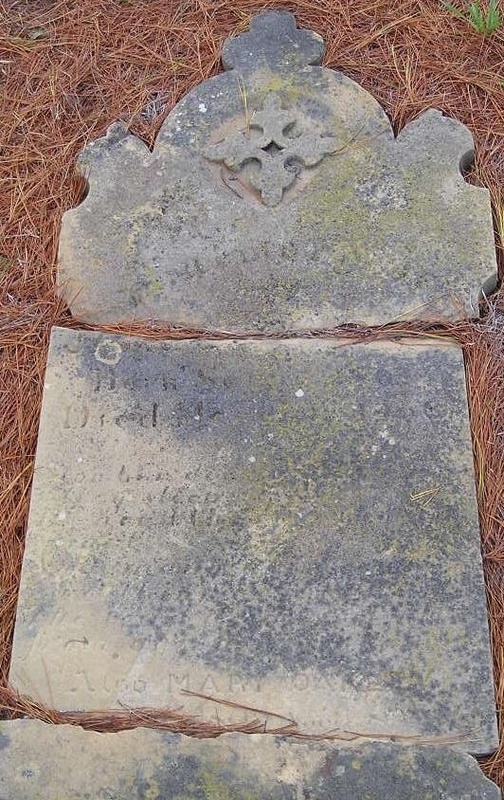 One thing to note – the displayed photo of John and Mary’s headstone (New Norfolk old public Cemetery) is not actually their headstone. When Mary Oakley died she was buried with her son James Oakley, rather than her husband. James Oakley died in 1906 from a self inflicted gunshot wound. And many a time we think of you. Mary Ann White was one of my biggest brick walls for many years because the informant on her death certificate (the undertaker) gave her birth place as Scotland. There was also a clue to her on the permission to marry application in 1854 that said “female must be 6 months free from offence”. That led me to think she might have been a convict. You can imagine how many Mary Ann White convicts there are !! Scouring convict records failed to yield a single possible candidate from Scotland. It was only in 2008 that I found the offence in the Hobart Lower Court records that was mentioned on the permissions to marry. Low and behold a female immigrant from the “Beulah” convicted for an offence against her master, Mr Evans. When I found Honorah Ryan on the same ships passenger manifest I knew I had the right gal…! !